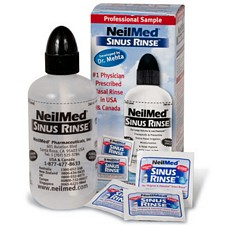 The Neilmed nasal rinse not only is an improvement over the traditional neti pot, after it should replaced, it is a perfect travelling tool for cleaning the other -nus. Not the sinus. I don't always travel with the packets. Sometimes I just carry bicarbonate of soda and salt-- which, if not in the original packaging, sometimes raises eyebrows at Customs. I think this is the perfect adaptation of a yogic tradition. Since the interior of the nose is the only avenue of a sense that connects *directly* with the brain, I think keeping one's noise and sense of smell intact is valuable. Research has suggested that a sign of moving towards dementia is the declining sense of smell. Hence the 'peanut butter test'. Keep it alive! A teaspoon of mustard or horse-radish does the trick for me.